The Glider comes equiped with our Aluminum Bar Brake/Drag Brake Combo. This Sled can handle teams of 1 to 10 dogs. The bolted design allows for great flexibility and maneuverability. Push the Handle Bar in either direction and the skis tilt for a turn or to hold the side of a hill. Our Aluminum Bar Brake / Drag Brake system is equiped with Heim Joints attaching the Brake to the Skis. These Joints allow the skis to tilt for turning while leaving the Brake parallel to the ground. Both Joints are rated at being able to hold 3,400 lbs of static weight. The Glider is lightweight, fun and enjoyable with the added stopping power of our Aluminum Bar Brake whose 3 Carbide Studs are able to dig into any ice or frozen ground. Yet, you can feather your dogs to a stop or hold the lines tight with the attached Drag Brake. 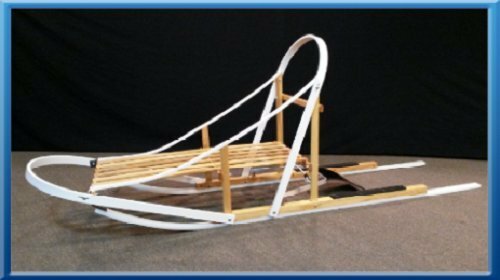 As with all our sleds, The Glider is built so you can easily add all the accessories you want or make quick repairs or modificataions. If you're even considering the slight possibility of ever running more than 4 dogs, The Glider is the sled for you. If you have any questions about this product by Affordable, contact us by completing and submitting the form below. If you are looking for a specif part number, please include it with your message.